A couple months ago, Namine’s orthopedic surgeon told us that she didn’t need to use her braces anymore. He felt that Namine’s legs and feet were strong enough, and stable enough, that she should be able to tolerate walking in her everyday socks and shoes. Namine works hard in therapy, and we know she loves to stand whenever and wherever she can, but she seems to be in more pain now than before she quit wearing her braces. Prior to this week’s physical therapy session, we got Namine’s AFOs out. Since she seems to be experiencing more pain standing up without them, we thought it would be a good idea to have her start using them again. If Namine’s feet hurt standing without the AFOs on, they would hurt even more crammed into braces too small for her growing feet. She just dealt with the pain today, but hopefully we can get her measured and fitted for new AFOs soon. There have been many times — too many to count, really — when I’ve written about what Namine’s doctors have expected or predicted, and Namine has done contrary. But since I got out Namine’s old AFOs, and I’m not even sure this is all of them, I want to tell you about this. 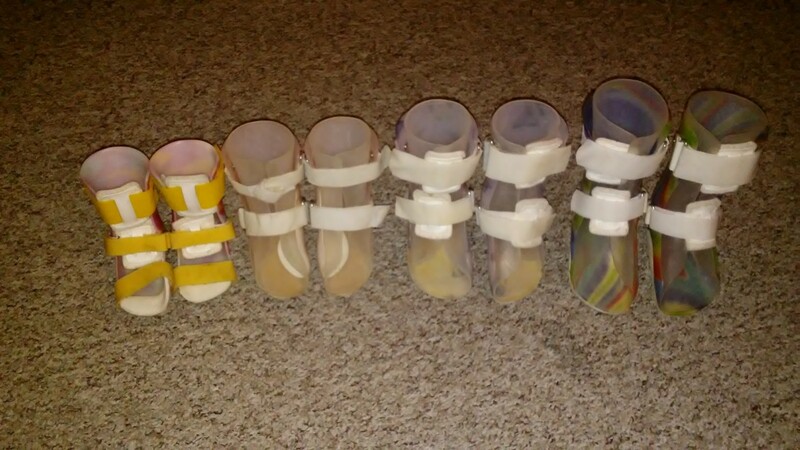 Before Namine’s first foot surgery, we were told that there was a good chance (they had since learned not to use the word “certainty” when talking about Namine) that once her feet were operated on, they would stop growing. I think it’s safe to say that hasn’t happened.